One of the most complicated and demanding joints in construction is considered to be the window installation joint. Penosil offers a range of products that perform an important and specific role to achieve correct and energy efficient solutions. Please click on the different facade types to get more information. ■ Heat-losses must be minimized. 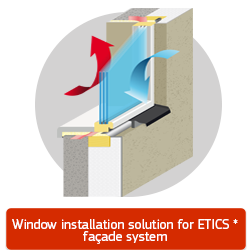 Window joints have to be sealed using materials with thermal conductivity as low as possible, such as PU foam. In addition to thermal conductivity, heat conductivity losses at the joint also depend on the joint depth losses are smaller for windows with a wide jamb because the joints are deeper. ■ It needs to be airtight to avoid heat-losses through air leakages. Frankly, the air tightness of a joint should be ensured if a good quality mounting foam is used correctly. In order to guarantee air tightness during the use of the building when it is exposed to various loads, special tapes, membranes or mastics should be applied as an additional airtight layer. ■ It needs to be vaportight to protect structure from excessive humidity, which can cause structure failures, cold bridges and mildew. Water vapour moves from inside-out or from outside-in depending on the climatic conditions. The former illustrates the case in Northern countries for most of the year, and the latter in warmer regions. Special tapes, membranes or mastics are used to keep water vapour from infiltrating the envelope structure. These materials are usually air- and vapor-tight simultaneously. It has to be also considered, that a vapor-tight and airtight structure must always have a high quality, elaborate ventilation solution. ■ It must be ensured that accidental humidity and moisture can move out of the structure. Accidental moisture can mean the moisture of materials during construction or moisture caught in the envelope due to poor engineering and/or construction. The “trapping” of accidental moisture in the structure must be avoided and it must be led out in the desired direction. This is done with the help of materials of low vapour resistance, such as special tapes or self-expanding seals. ■ All the internal structures must be protected from outside weather conditions such as UV-radiation, rainwater, wind, etc. To meet these requirements, joints have to be filled from the outside with a high-quality weatherproof sealant or a self-expanding tape. 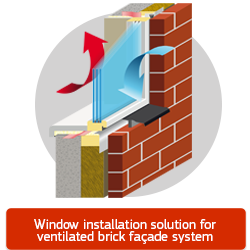 If joints are filled from the outside with a highly vapour-tight material, moisture must be allowed to move out of the structure, for example through facade ventilation. 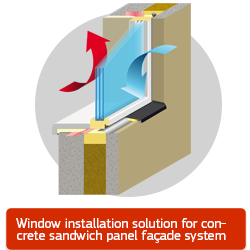 A window should always be installed in the thermal insulation layer to reduce the cold bridge effect. 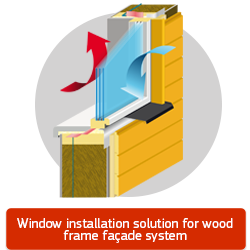 The cold bridge effect is also significantly reduced by choosing windows with wide jambs and sealing the installation joints with a mounting foam of low thermal conductivity. ■ It needs to be able to bare structural movements. During the life-cycle of a building, the window frame and the adjacent wall structure are exposed to various loads that cause deformation. It is important that the joint between the window jamb and the wall structure is designed considering all these potential deformations, and that the materials used at the joint can endure these movements without losing their properties. For example, it is recommended that more elastic foams are used for large windows, where the linear expansion of the window frame due to temperature and moisture is greater, and sealants with higher movement capability are also better suited for weathersealing. ■ While fulfilling all the requirements listed above, it also needs to maintain an esthetic look, both in internal and external environment. PENOSIL products that are described under the different facade types are designed to solve these problems. For more information click on the pictures above!